Before now a number of traditional surveying methods would have been carried out to capture survey data. To provide the outputs we offer, come from capturing point cloud data using a Faro Laser Scanners which we use to create a spec driven 3D models. From the model we are able to use this information to then provide applications which would have a taken many months even years to complete such detailed documents. The following text will explain the outputs that ALS offer and why they are a valuable asset to use compared to traditional methods. Piping and Instrumentation diagrams (P&IDs) are used by companies who run any form of process. P&IDs run a significant role in the maintenance and modification of the process that it describes and should reflect an up to date status. Capturing the data to create P&IDS can be a long a process due to the fact that they have to be accurate. So traditional methods involve surveyors having to walk the lines which takes time costing money, also having individuals out on site is a safety hazard. ALS has come up with a valuable solution, which the client finds beneficial. By scanning a site and building a 3D model, we are able to use the model to draw the P&IDs. ALS has accumulated over 40 years of experience creating, surveying and updating P&IDs across process industries and has realised that capturing the data of an entire site in a matter of days is far more relevant to the client, as this reduces time on site. Which has an effect on the cost, customers have seen a reduction of up to 50% and if there are any changes they can be added to the model later on. Traditional methods would have involved surveying an entire site again. ALS are now creating intelligent P&IDs which logs all the components into a database. This enables us to create custom reports to extract line lists, equipment lists and valve lists. The traditional method would require someone to manually monitor the P&IDs and list the valves or line lists; which is time consuming and is open to human error. Smart P&ID systems allow for a far greater control on consistency especially when being updated by multiple operators over time. With the reporting function clients can have a better understanding on what assets they have on site, by exporting reports they can keep a consistent check between asset and drawing management systems with their P&IDs. Created directly from 3D laser scan data, 3D models are gaining in popularity as they offer many further benefits to our clients. The 3D model file can be exported in a variety of 2D design file formats for clients engineering contractors. Based around all mainstream pipe specifications, in developing our 3D models we are in effect building a catalogue of pipework, flanges, valves fittings and pipe supports. Advanced 3D Laser Solutions Ltd (ALS) bring together services beyond those often considered by clients as available with 3D technologies. Unlike traditional drawings, a 3D process model represents a principle file that enables many ongoing applications clients can select as being appropriate to their business. For instance, implementing capital investments within ‘brown field’ sites have traditionally represented an expensive investment in design. The resulting design documents being of little ongoing use to client in continuing to maintain his processing facility and as a result are often left to become out dated and eventually lost. ALS process models can export 2D fabrication drawings in a format to suit client existing CAD platforms. Beyond the 3D process model, the 3D scan file will allow users to interrogate all site features, take measurements, annotate and use as a guide, details beyond those subject to 3D model file. Where traditional survey methods are employed, especially in areas where easy access was challenging, design clashes are not uncommon. Design clashes being discovered during the construction phase when the impact on project is greatest. With ALS 3D modelling techniques design clashes can be a thing from the past. No longer need your design process be as costly. Having 3D Laser scan data available, including elevated details not necessarily accessible without expensive temporary access platforms, ALS can interrogate in the three-dimensional world and identify potential areas where new installations may clash way before they become an expensive installation issue. The benefit from ALS modelling in existing and developing in the new installations, allows extracts from model to be used for specialist engineering services and piping isometrics for construction to be generated automatically. The modelling has included 3rd party items of equipment taken either from supplier’s model or built by ALS from 2D detail drawings. 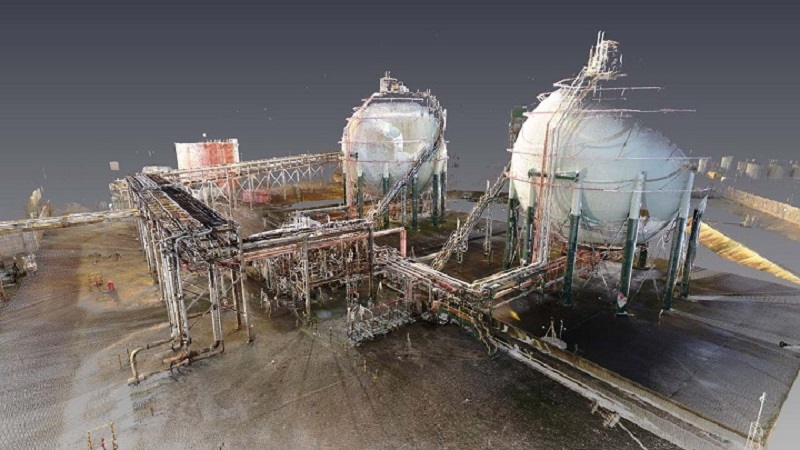 Laser scanning captures huge amounts of data, we are able to use this data (Point Cloud) to model out plant 3D Models, using the software Auto-desk Plant 3D, we use ASME piping specs for example CS150. Once modelled you have the automated processing of exporting a full range of piping isometrics, fully dimensioned and with a full list of bill of materials if required. Isometrics are all customised around our client’s standards including drawing sizes and borders. ALS can now produce video files directly from our 3D scan data. Our clients who not only used our scan files, passing to their design contractor for new capital investments, asked ALS to also prepare video files to cover their operational areas. This useful deliverable is being used to market their operations but equally, the video files can be used to aid health and safety, operational training or induction training. Capturing accurate tank data can aid the maintenance of a particular facility. Using laser scanners to record information so that it can be assessed and shared among colleagues across an organisation located around the world is invaluable asset to obtain.